The past two weeks have brought snow, cold, and plenty of holiday cheer. This has also been an initiation into home ownership by necessitating endless shoveling. It has also made me exceptionally happy that we did not get one of the other houses we were interested in on the corner of two streets for it would have meant triple the shoveling we have at this place. Our next house will be chosen as the one with the smallest yard and shoveling space. 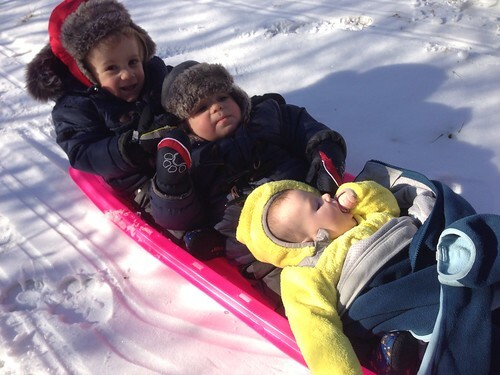 The snow did afford a nice opportunity to have all the cousins sled together and still sort of be scared of the outside and the snow. They did, however, tolerate a forced sled ride. Before my parents' arrival I had to go pick up some stuff at Crate & Barrel. 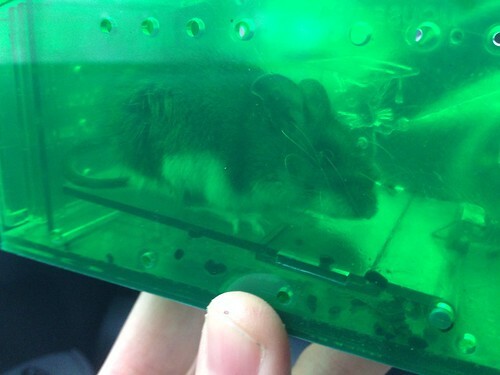 In exchange for using her car Lauren gave me a mouse from her basement that I was to deposit on the other side of the river from their house in a designated wildlife area. I did bring it to the other side of the river but I may have used the parking lot of the Crate & Barrel as the designated wildlife area. There was some grass across the street so I'm sure the mouse had a blast if he made it to the other side alive. 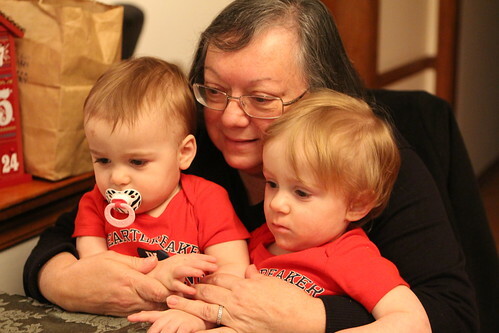 Nana and Grandpa arrived right on schedule and the boys were very happy to have the guests. Particularly since Nana usually travels with six or seven different media devices, all of which are able to play various Elmo videos. They like anyone who can give them access to Elmo. The days leading up to Christmas were full of lots of assembly. My dad assembled their table and chairs while I assembled their wagon. They both wanted to help with assembly but when the wagon began to take form they wouldn't stop crawling into it making the task of putting it together take about ten times as long as if they weren't around. Then, they wouldn't accept anything other than riding in their freshly assembled wagon. 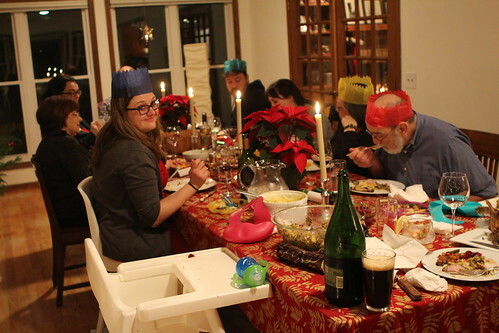 On Christmas we put out their kitchen which my Dad had put together and they enjoyed having another large toy which they could fight over. Christmas morning was full of delicious breakfast, mimosas, and opening about 25% of our presents before it was time for the guys to take their nap. 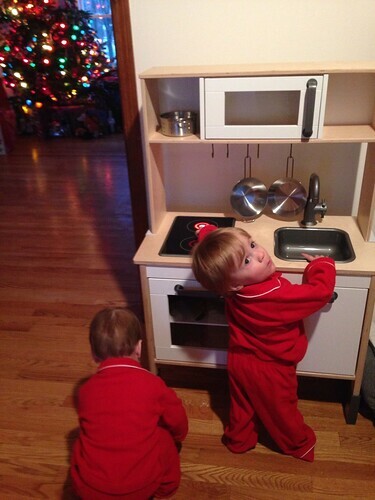 During their nap we continued to open presents, then picked it back up when they woke up, right up until dinner time. 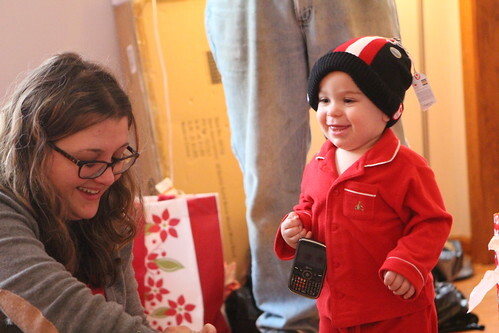 They didn't even know what to make of it when they received an Elmo of their very own. They have been obsessed with Elmo in his many forms but no Elmo has ever captured their attention like the Elmo who stands and watches guard on their daycare room from high atop a shelf. Now there was an even larger Elmo in their own home, one they could hug, interact with, and ultimately fight over. 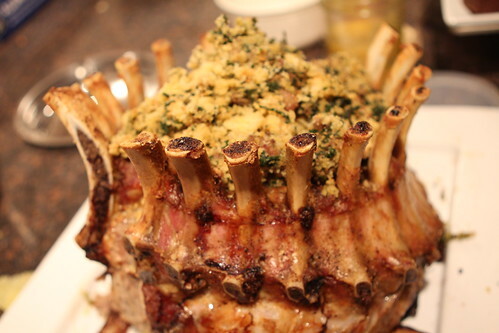 For Christmas dinner I made my first ever crown roast of pork which was sensational. 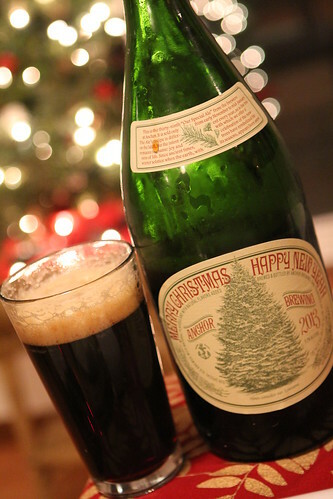 It went down wonderfully with a huge bottle of Anchor Brewing Merry Christmas, Happy New Year. 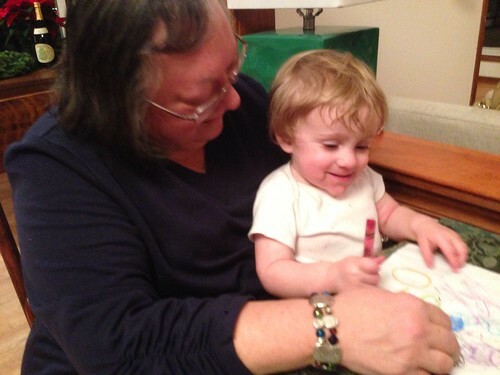 After a very quick week Nana and Grandpa had to leave and hit the road back to Rhode Island. We missed them right away but Elliott comforted himself knowing that he had the Zebra they had given Martin for Christmas, his new favorite toy. Shortly thereafter Aunt Lisa had to depart as well. Only after she reclaimed her sunglasses and phone from Elliott. All he needed was her wolf purse and he would have pretty much had her entire persona captured. 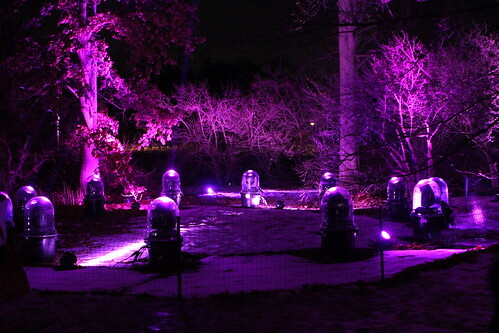 On the warmest night in the past month, with temperatures all the way in the 20s, we went to The Illumination at the Morton Aboretum. 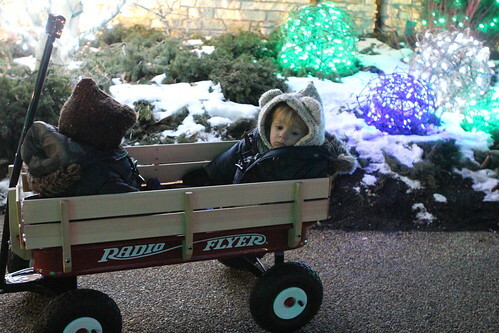 They mostly just sat in the wagon, unmoving in the terrible cold. Afterward we warmed up by the fire while I finished a beer that remained icy cold on our long walk through the park. At home I was able to enjoy this Narragansett Coffee Milk Stout, a great after-dinner beer combining some of my favorite Rhode Island things all in one. It was a gift from my parents for Christmas along with my father's Narragansett beer glass that he got after touring their brewery in the late 1960s. 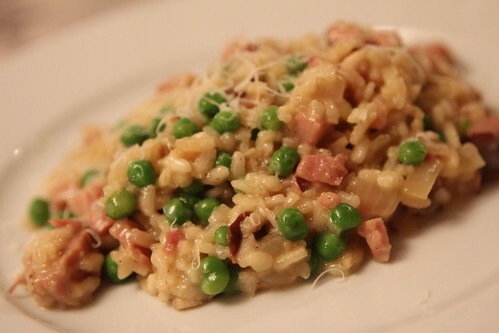 As things wound down after Christmas I made this leftover risotto with Jen's father's Christmas Eve ham and some peas. Martin has taken to sitting down right beside our fireplace and just hanging out there. Elliott, on the other hand, prefers climbing inside of one of our kitchen cabinets and hanging out on the shelf. They have each found their respective fortresses of solitude. 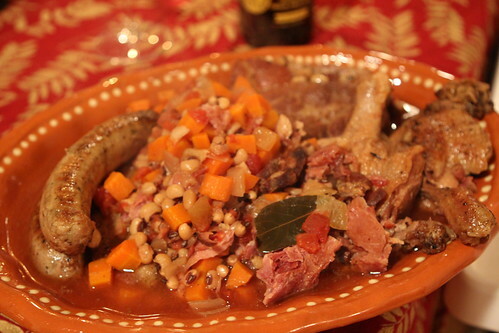 For New Year's Day we made cassoulet, for the first time, in a Crock Pot. I have never used a Crock Pot in my life until moving to Illinois. Since we have embraced the return to suburban living so heartily it seems only fitting that we eat frequently from the warm bowl of a Crock Pot. It's only a matter of time before our pantry is stocked exclusively with cans of cream of mushroom soup and Ritz crackers. In the past couple of days Elliott has discovered something new: tantrums. His latest thing is that he will actually lie on his belly and smash his own face into the floor as hard as he can. It takes very little to trigger this. It's not like he wants something and we tell him he can't have it. 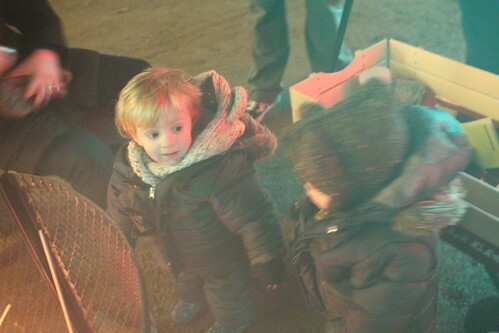 It's usually something small like he goes to pick something up and drops it, or that Martin gently bumps into him. Last night was the worst night in a while as far as tantrums. Luckily it would seem that the head-banging thing is self-regulating in that eventually he will grow weary of bashing his head into the floor because it hurts pretty bad. 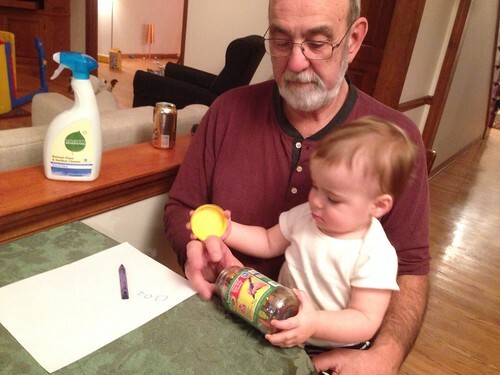 Unfortunately, until he figures this out, he will have a pretty large bruise on his forehead. We have also been serious about sleep training in the past week. As we have been guests in someone else's home for the past few months we felt it best not to torment our hosts with screaming babies more than they already were being tormented. Now it's time to get serious and let the guys, mostly Elliott, scream before bed. We've gotten good at not caving in and simply patting their backs or holding their hands until they fall asleep. It's too bad because it would be so much nicer and so much easier to just hold them until they fall asleep. The funny thing is that while Elliott carries on a lot more before getting to bed, he has been sleeping through the night regularly since we started being strict about it. Could it be that this new technique has made for a better chance of the kids sleeping through the night? Or could it be that I just jinxed us for a terrible, terrible night tonight? Either way we're going to continue Googling: "Foolproof, easy way to make sure your child never has a tantrum." So far we haven't found anything but the answer has got to be there somewhere. Thanks for posting these treasured moments!